We know how much you delight in the fresh, creamy taste of our real 100% Mozzarella cheese, so we gave you more of it. Now, when you sink your teeth into this EXTRAordinary pizza, you’ll taste EXTRA cheese, feel EXTRA love, and want to share any EXTRA. NOT! Preheat to 425 F. To enjoy a crispy crust, put pizza directly on oven rack. Bake for 11-12 minutes or until cheese is melted and crust is golden brown. If you prefer a softer crust, place pizza on a nonstick baking sheet. Bake 13-14 minutes. Preheat to 425 F. To enjoy a crispy crust, put pizza directly on oven rack. Bake for 12-13 minutes or until cheese is melted and crust is golden brown. If you prefer a softer crust, place pizza on a nonstick baking sheet. Bake 14-15 minutes. Not designed for microwave preparation. Caution: Product will be hot. 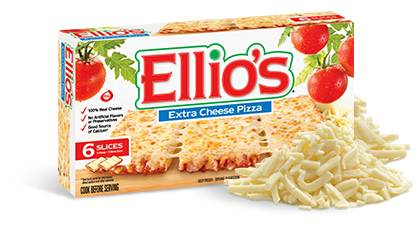 Ellio's® is a registered trademark of Dr. Oetker USA, LLC. The Dr. Oetker logo is a registered trademark of Dr. Oetker USA, LLC.